The tongue is a mass of muscle that is almost completely covered by a mucous membrane. It occupies most of the oral cavity and oropharynx. It is known for its role in taste, but it also assists with mastication (chewing), deglutition (swallowing), articulation (speech), and oral cleansing. Five cranial nerves contribute to the complex innervation of this multifunctional organ. The embryologic origins of the tongue first appear at 4 weeks' gestation. The body of the tongue forms from derivatives of the first branchial arch. This gives rise to 2 lateral lingual swellings and 1 median swelling (known as the tuberculum impar). The lateral lingual swellings slowly grow over the tuberculum impar and merge, forming the anterior two thirds of the tongue. Parts of the second, third, and fourth branchial arches give rise to the base of the tongue. Occipital somites give rise to myoblasts, which form the intrinsic tongue musculature. From anterior to posterior, the tongue has 3 surfaces: tip, body, and base. The tip is the highly mobile, pointed anterior portion of the tongue. Posterior to the tip lies the body of the tongue, which has dorsal (superior) and ventral (inferior) surfaces (see the image and the video below). View of ventral (top) and dorsal (bottom) surfaces of tongue. On dorsal surface, taste buds (vallate papillae) are visible along junction of anterior two thirds and posterior one third of the tongue. On dorsal surface, one may note frenulum in midline and ducts from submandibular gland emptying just lateral to frenulum. Video courtesy of Dr. Ravi Elluru. The median sulcus of the tongue separates the body into left and right halves. The terminal sulcus, or groove, is a V-shaped furrow that separates the body from the base of the tongue. At the tip of this sulcus is the foramen cecum, a remnant of the proximal thyroglossal duct. The base of tongue contains the lingual tonsils, the inferiormost portion of Waldeyer’s ring. The surface of the body of the tongue derives its characteristic appearance from the presence of lingual papillae, which are projections of lamina propria covered with epithelium. The 4 types of lingual papillae are as follows: vallate (circumvallate), foliate, filiform, and fungiform. The foliate papillae are small folds of mucosa located along the lateral surface of the tongue. The filiform papillae are thin and long; they are the most numerous papillae and are located along the entire dorsum of the tongue, but they are not involved in taste sensation. The fungiform papillae are mushroom shaped and are dispersed most densely along the tip and lateral surfaces of the tongue; humans have approximately 200-300 fungiform papillae. Each vallate, foliate, and fungiform papilla contains taste buds (250, 1000, and 1600 taste buds, respectively). Each taste bud is innervated by several nerve fibers. In humans, all taste buds can perceive the 5 different taste qualities: salt, sweet, bitter, acid, and umami. Each taste bud consists of taste receptor, basal, and edge cells. When a taste molecule binds to a taste receptor, the receptor cell depolarizes, causing an influx of Ca++, which results in the release of an unknown neurotransmitter. Following depolarization, the afferent neural pathway depends on the location of the taste bud that was stimulated. In the anterior two thirds of the tongue, the chorda tympani branch of the facial nerve (cranial nerve VII) is stimulated. The lingual-tonsillar branch of the glossopharyngeal nerve (cranial nerve IX) relays taste information from the posterior third of the tongue. Taste fibers from the anterior two thirds of the tongue first travel with the lingual nerve and then are relayed to the chorda tympani nerve. This nerve enters the temporal bone from the infratemporal fossa, where it joins the facial nerve and travels to the geniculate ganglion, where its pseudounipolar cell bodies are located. From the geniculate, taste fibers travel in the nervus intermedius to the nucleus of the solitary tract located in the medulla oblongata. 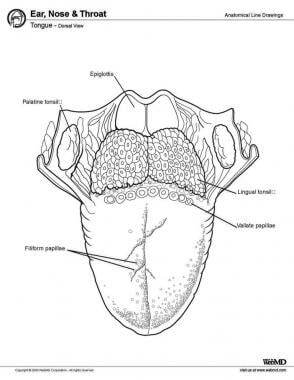 Similarly, taste fibers from the posterior one third of the tongue travel with the lingual-tonsillar nerve to the inferior glossopharyngeal ganglion and then to the nucleus of the solitary tract. Second-order neurons then project taste fibers to the parabrachial nucleus of the pons. The central tegmental tract carries taste sensation from the pons to the thalamus. The pathway ends in the frontal operculum and insular cortex. The tongue has 4 intrinsic and 4 extrinsic muscles (see Table 1 and the image below). The muscles on each side of the tongue are separated by a fibrous lingual septum. Extrinsic muscles are so named because they originate outside the tongue and insert within it; intrinsic muscles are within the substance of the organ and do not insert on bone. Although the muscles do not act in isolation, intrinsic muscles generally alter the shape of the tongue, whereas extrinsic muscles alter its position. Similar to most of the head and neck region, the tongue derives its arterial blood supply from the external carotid artery. The lingual artery branches off the external carotid artery deep to the stylohyoid muscle. At first, it travels superomedially; after a short distance, it changes direction and moves anteroinferiorly. The hypoglossal nerve (cranial nerve XII) crosses over it laterally before it enters the tongue deep in the hyoglossus muscle. Within the tongue, the lingual artery gives rise to its 3 main branches: the dorsal lingual, deep lingual, and sublingual arteries. The dorsal lingual artery supplies the base of the tongue. The deep lingual artery travels on the lower surface of the tongue to the tip. A branch to the sublingual gland and the floor of the mouth is known as the sublingual artery. The veins of the tongue parallel the lingual artery branches. The deep lingual vein begins at the tip of the tongue and travels posteriorly to join the sublingual vein. This drains into the dorsal lingual vein, which accompanies the lingual artery. Directly or indirectly, this vein empties into the internal jugular vein. Motor innervation for all of the muscles of the tongue comes from the hypoglossal nerve--with the exception of the palatoglossus, which is supplied by the pharyngeal plexus (fibers from the cranial root of the spinal accessory nerve carried by the vagus nerve). General sensation of the anterior two thirds of the tongue is supplied by the lingual nerve, a terminal branch of the third division of the trigeminal nerve (V3). Taste sensation for this portion of the tongue is carried by the chorda tympani branch of the facial nerve. The posterior third of the tongue relays general and sensation via the lingual-tonsillar branch of the glossopharyngeal nerve. 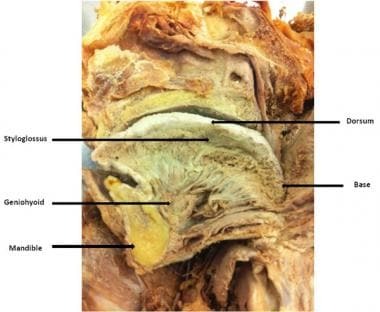 Some general and taste sensation from the base of tongue anterior to the epiglottis is carried by the internal laryngeal branch of the superior laryngeal nerve (CN X). The lymphatic drainage of the tongue is complex. Lymphatics from the tip of the tongue travel to the submental lymph nodes. This can be ipsilateral or bilateral depending on the site of the lesion. Lymph from the medial anterior two thirds of the tongue travels to the deep cervical lymph nodes, and lymph from the lateral anterior tongue goes to the submandibular nodes. The tongue-base lymphatics drain bilaterally into the deep cervical lymph nodes. Ankyloglossia (tongue-tie) is caused by an abnormally short lingual frenulum, which can inhibit tongue movement. Macroglossia is a congenital enlargement of the tongue. Microglossia is a small tongue, and aglossia an absent tongue  ; these are rare and are usually associated with other limb abnormalities. Brown hairy tongue in middle-aged woman who drinks coffee. Note how condition is limited to middorsal part of tongue, becoming more prominent toward posterior part. Injury to the hypoglossal nerve (cranial nerve XII) results in deviation of the tongue toward the paralyzed side during protrusion. The tongue also atrophies over time on the paralyzed side. Sadler T. Head and neck. Sun B. Langman's Medical Embryology. 9th ed. Philadelphia: Lippincott Williams & Wilkins; 2004. 382-390. Smith, DV. Taste and smell dysfunction. Paparella MM, Shumrick DA, Gluckman JL, Meyerhoff WL. Otolaryngology. 3rd ed. Philadelphia: WB Saunders Co; 1991. Roberts IM, Solomon SE, Brusco OA, Goldberg W, Bernstein JJ. Neuromodulators of the lingual von Ebner gland: an immunocytochemical study. Histochemistry. 1991. 96(2):153-6. [Medline]. Gray H. Anatomy of the Human Body. Philadelphia: Lea & Febiger, Bartleby.com; 1918, 2000. [Full Text]. Thorp MA, de Waal PJ, Prescott CA. Extreme microglossia. Int J Pediatr Otorhinolaryngol. 2003 May. 67(5):473-7. [Medline]. Korber A, Dissemond J. Images in clinical medicine. Black hairy tongue. N Engl J Med. 2006 Jan 5. 354(1):67. [Medline]. [Full Text]. Clinical appearance of lateral tongue squamous cell carcinoma in 80-year-old man with previous history of smoking and regular alcoholic beverage consumption. Medscape Reference thanks Ravindhra G Elluru, MD, PhD, Associate Professor, Department of Otolaryngology Head and Neck Surgery, University of Cincinnati College of Medicine, Pediatric Otolaryngologist, Department of Otolaryngology, Cincinnati Children's Hospital Medical Center, for the video contribution to this article.